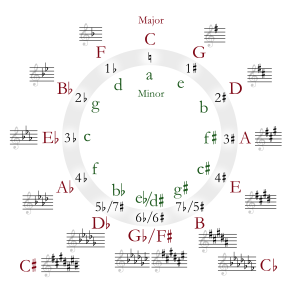 B♭ minor or B-flat minor is a minor scale based on B-flat, consisting of the pitches B♭, C, D♭, E♭, F, G♭, and A♭. Its key signature has five flats. The harmonic minor scale would use an A♮ instead of A♭. Its relative major is D-flat major, and its parallel major is B-flat major. Its enharmonic equivalent is A-sharp minor. B-flat minor is traditionally a 'dark' key." Some important oboe solos in this key in the orchestral literature include the second movement of Tchaikovsky's Symphony No. 4, which depicts "the feeling that you get when you are all alone", in Tchaikovsky's words. Tchaikovsky's Piano Concerto No. 1 is also in B-flat minor. The old valveless horn was barely capable of playing in B-flat minor; the only example found in 18th century music is a modulation that occurs in the first minuet of Franz Krommer's Concertino in D major, Opus 80. All eight songs on The Raveonettes' Whip It On album are in the key of B-flat minor. Sune Rose Wagner said it was "Because Shostakovich's symphony no. 13 was in B flat minor." ^ "10 Questions with Sune Rose Wagner". http://ekwimmer.blogspot.com/2007/08/10-questions-with-sune-rose-wagner.html. Retrieved 2008-02-07. This article is licensed under the GNU Free Documentation License. It uses material from the Wikipedia article "B-flat minor". Allthough most Wikipedia articles provide accurate information accuracy can not be guaranteed.